when it was introduced what it applies to the geographical coverage the environmental domains it aims to address the industries concerned revenues, costs or rates exemptions. A unique database Taxes, subsidies, and other economic instruments provide important market signals that can influence the behaviour of producers and consumers. They can incorporate environmental costs and benefits into the budgets of businesses and households, by increasing (or decreasing) the price of a product or service. As such, they help internalise the use of natural resources or the emission of pollutants into firms’ or households’ decisions. They can be an effective and cost-efficient way to achieve environmental goals, such as fighting air pollution and climate change, or protecting biodiversity. Responding to growing demands for monitoring and analysis of policies that affect the environment and natural resources requires reliable, comprehensive and timely data on a range of policy instruments. Since the early 1970s, the role of economic instruments has been growing: the number of applications for pollution control and natural resource management has increased considerably; the variety of policy instruments in use has also grown; and other types of economic instruments (e.g. deposit‑refund systems, performance bonds or liability payments) have also appeared. “Policy Instruments for the Environment” is a systematic and structured database suitable for statistical analysis. PINE provides the same type of information for each policy instrument, structured into a large number of quantitative and qualitative variables. Everything is linked. PINE is a relational database: all pieces of information are linked through unique identifiers. land, soil, forests, biodiversity, wildlife and fish stocks. ever introduced was in Finland, in 1990. Norway, Sweden (both in 1991) and Denmark (1994) followed. These four countries also introduced the first taxes and fees on other air pollutants, particularly on emissions of sulphur dioxide and nitrogen oxides. Fees and charges What is the difference between a tax and a fee/charge? A charge is a required payment to general government, meaning that the tax payer gets something in return, more or less in proportion to the payment made, whereas a tax is a compulsory unrequited payment. For example, a wastewater payment which varies according to the volume of water consumed would constitute a fee (sometimes called a charge), while a wastewater payment which varies according to the amount of pollution generated would be classified as a tax. In the database, the terms “fees” and “charges” are used interchangeably. The PINE database currently covers more than 530 fees and charges in 49 countries. It captures information on rates, revenue, frequency and responsibility for payments, exemptions, etc. Tradable permits Tradable permits are used to allocate emission or resource exploitation rights. They are increasingly used around the world to help achieve policy objectives in mitigating climate change, air pollution, water scarcity or over-harvesting of fisheries. The Regional Greenhouse Gas Initiative (RGGI) is the first mandatory market-based program in the United States to reduce greenhouse gas emissions. RGGI is a cooperative effort among the states of Connecticut, Delaware, Maine, Maryland, Massachusetts, New Hampshire, New York, Rhode Island, and Vermont to cap and reduce CO2 emissions from the power sector. The RGGI States use a market-based cap-and-trade approach, that includes a multi-state CO2 emissions budget. This cap was set at 91 million short tons in 2014, and declines by 2.5% each year from 2015 to 2020. Auction proceeds are invested in consumer benefit programmes to improve energy efficiency and develop renewable energy technologies. Deposit-refund systems A deposit-refund system places a surcharge on the price of potentially polluting products. When pollution is avoided, by returning the products or their residuals, the surcharge is refunded. Deposit-refund systems are not limited to bottles: they also cover lead-acid batteries, motor vehicles or scrapped tyres. The PINE database currently covers 60 different deposit-refund systems â&#x20AC;&#x201C; 44 at a national level and 16 at a subnational level â&#x20AC;&#x201C; in 29 countries. It captures information, when available, on annual revenue, deposit rate, refund rate, return percentage, industry, product category, administrative costs, etc. to encourage return of soda water containers date all the way back to 1799, in Ireland, but the PINE database does not go back that far. The oldest system registered in the database is the Oregon bottle bill, introduced in 1971. Retailers pay the distributor for each bottle purchased, and turn to consumers to collect deposits. Scrapped tyres deposit-refund systems in Denmark achieve a return ratio of 97%. The Netherlands introduced the Energy Investment Tax Allowance in 1997, to reduce up-front investment costs for firms investing in the newest energy-saving and sustainable energy technologies. Firms investing in technologies listed in the annually updated ‘Energy List’ may deduct some of the investment costs from their taxable profits, reducing the need for financing. The main weakness of the tax allowance is the difficulty to prevent free-riders from receiving subsidies: more stringent eligibility rules and evaluation processes have improved the subsidy’s effectiveness considerably. Voluntary approaches Voluntary approaches are not economic instruments, but commitments by firms or industries to improve their environmental performance beyond legal obligations. Voluntary agreements allow building consensus and engage stakeholders, but are often supported by regular oversight to verify that environmental performance actually improves. The PINE database includes agreements negotiated between a government authority and private parties, or between industries. It covers 146 voluntary approaches implemented in 24 countries, including unilateral commitments, negotiated agreements or voluntary programmes. Voluntary programmes are quite popular, but most of them are not reported in the database yet. PINE contains information on purpose, evaluation mechanism, revenue, participants, domain, product category, type of voluntary approach, regional scope, legal status, monitoring type, administrative costs, etc. The database also tags the consumption categories associated with each policy instrument, according to the UN “Classification of individual consumption by purpose” (COICOP). It gives an idea of what part of household’s budget will be affected by the tax, the charge or the subsidy. 3. Furnishings, household equipment, etc. Biodiversity was recently added to the list of environmental domains. This allows all types of instruments associated with biodiversity to be retrieved. Currently, about 490 policy instruments in 52 countries have been identified as biodiversityrelevant, 90% of which are still in force today. As in many other domains, taxes, fees and charges are among the most frequently used instruments directed at conserving and sustainably using biodiversity. Biodiversity-relevant taxes generated a revenue of USD 2 billion per year on average during 2011-2015, that is, 0.56% of the total revenue from environmentally relevant taxes in OECD countries. The revenue has remained more-or-less constant over the past 15 years. Biodiversity targets Tagging biodiversity-relevant instruments in the database is useful to monitor progress towards international targets: United Nations’ Convention on Biological Diversity – Aichi Target 3 By 2020, incentives, including subsidies, harmful to biodiversity are eliminated, phased out or reformed (…) and positive incentives for the conservation and sustainable use of biodiversity are developed and applied. (…) United Nations’ Sustainable Development Goal 14 Conserve and sustainably use the oceans, seas and marine resources for sustainable development. United Nations’ Sustainable Development Goal 15 Targets 15A and 15B. Mobilize and significantly increase financial resources from all sources to conserve and sustainably use biodiversity and ecosystems (... and) to finance sustainable forest management (...). Reinforce the industry dimension of PINE to allow the data on policy instruments to be linked with industry-level economic statistics. 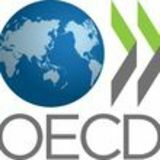 Align PINE data on environmentally relevant tax revenues with the System of Environmental-Economic Accounting (SEEA) and the OECD Revenue Statistics. This will allow links to environmental pressures and economic outcomes to be made via input-output analyses. It can also help better understand the role of environmental policy for international trade and competitiveness. Reinforce the consumption dimension of PINE to allow the data on policy instruments to be linked with household-level economic statistics. This can support analyses of the distributional impacts of environmental and natural resource policies. Better capture data on biodiversity-relevant policy instruments (i.e. payments for ecosystem services and biodiversity offsets) by raising their profile in PINE. This could assist efforts on developing indicators to monitor progress towards the Aichi Biodiversity Target 3. Further expand the cross-thematic tagging by adding environmental domains for nitrogen and ocean/marine. This would support efforts to monitor oceanrelated policy instruments with relevance to the environment and natural resource management (e.g., SDG 14). Conduct data collection for non-OECD countries in a systematic manner, and expand geographic coverage to other non-OECD countries, eventually achieving global coverage. Delivering on these opportunities will require voluntary contributions from countries and donors. Advanced users Contact us to build your own SQL query and access the full relational database. Taxes, subsidies, and other economic instruments provide important market signals that can influence the behaviour of producers and consumers. 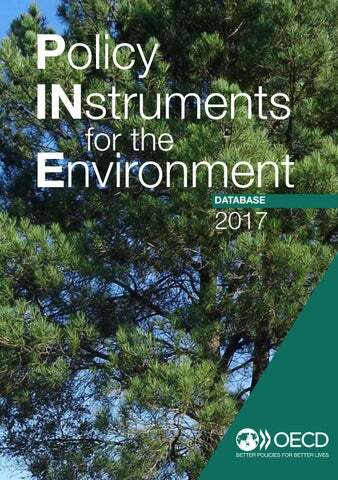 “Policy INstruments for the Environment” is a unique database, gathering key quantitative and qualitative information on 3 200 instruments, in all OECD countries and many others. Contact Miguel Cárdenas Rodríguez, Database Manager: miguel.cardenasrodriguez@oecd.org Ivan Hašcic, Senior Economist: ivan.hascic@oecd.org Nils Axel Braathen, Principal Administrator: nils-axel.braathen@oecd.org Nathalie Girouard, Head of Division, Environmental Performance and Indicators: nathalie.girouard@oecd.org Image credits. Cover photo: DR. p. 9: Nuon/Flickr, Creative Commons licence. Other photos: Shutterstock.com: Lijuangao, Artzenter, Dan Logan, Jan Kranendonk, Rokas Tenys. Icons p. 11 from TheNounProject.com: Krisada, IconFactoryTeam, GhalibMansoor, ViconsDesign, Marie van der Broeck, Jason Dilworth, Novita Dian. Disclaimers. This document and any map included herein are without prejudice to the status of or sovereignty over any territory, to the delimitation of international frontiers and boundaries and to the name of any territory, city or area. The statistical data for Israel are supplied by and under the responsibility of the relevant Israeli authorities. The use of such data by the OECD is without prejudice to the status of the Golan Heights, East Jerusalem and Israeli settlements in the West Bank under the terms of international law.